Ernesto Quiñonez is from Spanish Harlem in New York City. Before his first publication he was heralded by the Village Voice as a “Writer On the Verge”. 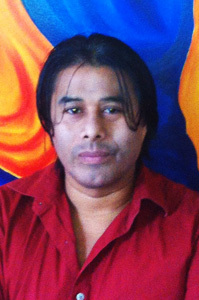 His debut novel Bodega Dreams, was chosen as a Los Angeles Times and a New York Times Notable Book of the year and has become a landmark in contemporary literature, required reading in many high schools and colleges around the country and the New York Times claimed the novel as a “New Immigrant Classic”. He is a Sundance Writer’s Lab fellow and is currently an associate professor at Cornell University’s MFA program. My parents. Growing up with a communist dad and a religious mom would make great material for my writing. Their marriage is evidence that these two ideologies can live side by side and are more identical than many would like to give them credit for. 2. Define your experience growing up being Latino? And being Latino in today’s world. Yes, the cards were stacked against me but I never got stuck in victimization. I had a vision, and though “The Man” is real and is out there to throw road blocks at you because you are Latino, that never took away my focus and drive in accomplishing what I was after. In today’s world being Latino—to me—means Representing. Letting others see that putting aside hate, resentment, defeat and all those qualities that make victims but instead embracing hard work and patience we will achieve. We can aspire to the highest levels, regardless of what the evil side of “Amerikkka” throws at us. Poverty is violence. Growing up in New York City during the 70s and 80s was tough. These were the years of no heat, no hot water, rats, crime and arson. But with good parenting, a love for all things artistic, and a bit of luck I did ok. The City College of New York’s English Department and all those great professors. They taught me that writing about Spanish Harlem was not a waste of time and that Latino stories are a valuable element that is lacking in American Literature. Keeping a modest and humble attitude, while continuing to help my students and anyone else in whichever way I can. There is no better example than one’s own life, and if some young gun sees that a kid from El Barrio is now a writer and Ivy League Professor, he/she might say, “Hey I can do that and I can do it better.” You go, man. Pa’lante siempre pa’lante.